"Okay, I got what I want for my pic. Can you draw a kewl Suicune if it's not too much trouble?" I hope this is kewl. XD One of the more "labor intesive" things I've done in a while that's for sure. XD I've never drawn a Suicune and I only have two cards of it so I used them as reference....Yes I still have Pokemon cards shush! this picture is actually nostalgic to me at this point. 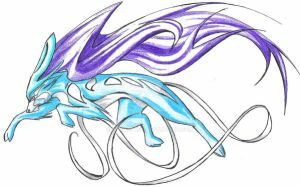 not suicune itself, this picture of it. What software did you use to draw this? Someone edited this picture and made it look hideous! Here's the link, [link]. This is such a great drawing. I use it as a profile pic on Fanfiction. I'VE BEEN SEARCHING EVERYWHERE FOR THIS. In her head, it's the Cerberus logo from Mass Effect. SUICUNE IS INDOCTRINATED, HE WORKS FOR THE ILLUSIVE MAN AND THE REAPERS !!! omg i love suicune! could you draw me one!? do you draw pokemon allot? [link] your image has been used for a fakecard. *looks at downloads* how does this have more DL's than views? suicune is my favorite pokemon . woah this is really cool ! i found this on google. may i use your picture for a pokemon card? Wow this is really good! The glow and the shading and colouring, it looks fantastic! May I borrow this for a wallpaper for my laptop please? cheers! Do you do anymore of these? I absolutely LOVE this picture! It's probably the best Suicune picture I've ever seen! Great job! May I use this picture for a banner in my signaturE?? May I use this picture for a banner in my Signature??? OMG!!! 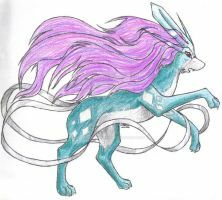 AWESOME PICTURE OF SUICUNE!!! Beautiful. <3 I love your style.